Who wouldn’t love a holiday whose sole purpose is to share a meal? As a French woman I’ve always wondered why the French didn’t come up with that idea. I started making Thanksgiving dinners long before I moved to the United States. The custom began with my mother, who is American (in a somewhat roundabout way), and though I cannot remember that we celebrated Thanksgiving every year as a family, I certainly picked up the tradition when I left home, and have celebrated, if not hosted it consistently since. My first endeavor involved roasting a chicken with wild rice stuffing in a tiny countertop oven in a small Parisian studio apartment. Later, in Germany, turkeys replaced chickens as the dinner parties became larger to fit the size of the beautiful old apartments students could afford in Berlin in the 1990s (I haven’t lived in such a big apartment since). I discovered that KaDeWe was the only store in the city to carry (frozen) turkeys in November. Since I moved to New York I have expanded on and modified recipes, and refined a menu that to me is traditional, though it isn’t exactly, in spite of the turkey, cranberry sauce, and pumpkin pie. On Thursday I will make the dishes I have honed in recent years. In the future I am sure some things will change. 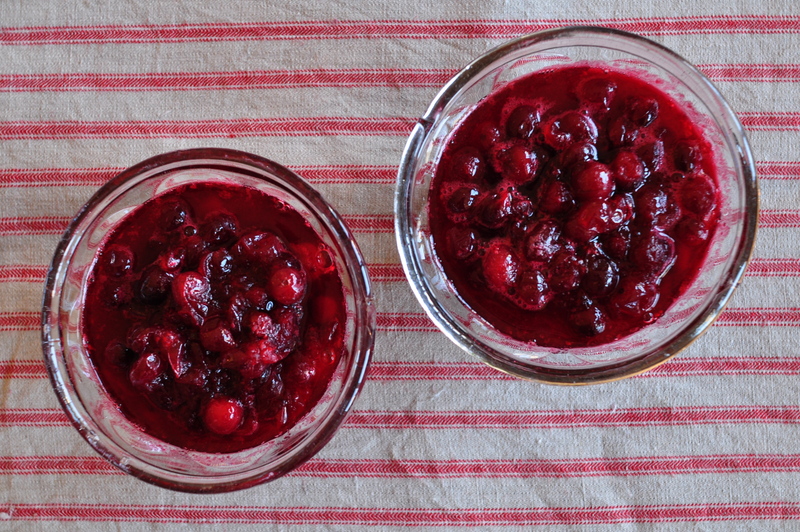 There is no possible excuse for buying cranberry sauce it’s so ridiculously easy to make. I usually do it the weekend before Thanksgiving. In a medium saucepan, dissolve the sugar in the water and bring to a boil, stirring occasionally. Add cranberries and lemon zest, mix and let simmer for 15-20 minutes, stirring occasionally, until the cranberries have popped. Remove from heat and mix in some Grand Marnier if desired. 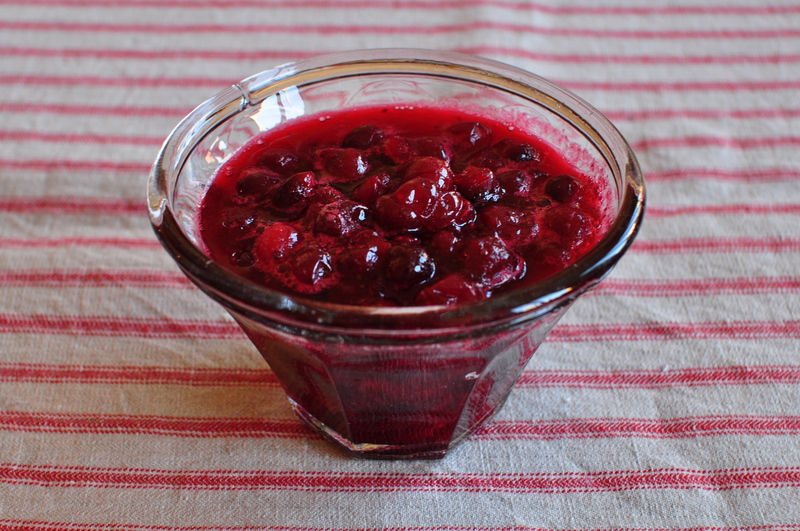 Once cool, transfer to a jar or bowl and refrigerate (if you make the cranberry sauce a while in advance, sterilize the jars in boiling water, pour in cranberry sauce while hot, and seal tightly). *For some reason, cranberries are practically always sold in 12 oz bags, so I started using that as the reference. This entry was posted on 22 November 2010 at 09:25 and is filed under Fall, Holidays, Homemade and preserves, Thanksgiving. You can follow any responses to this entry through the RSS 2.0 feed. You can skip to the end and leave a response. Pinging is currently not allowed. Thanks for the recipe inspiration Valerie. Normally I don’t make any cranberry sauce as neither Joe nor I particularly care for like it. But as some of our guests probably will I decided to follow your recipe. Well more or less – I used one lemon zest and one clementine zest and instead of Gran Marnier (had none) I added a spoon of Rutherglen Brown Muscat. It is still warm but tastes quite yummy.